James Kerry was born in Nottingham in 18832, the second of eleven surviving children of Henry (b. 1861, Radford, Nottingham) and Elizabeth Emma (b. 1862, Nottingham née Silcock)3. James was a lace maker who, by 1901, was living with his wife and large family at 10 Lumley Street, in the Hyson Green area of Nottingham. Most of the family were eventually to find employment in the lace trade and this was to include James but, at this date, he was an 18-year-old dye worker4. Sometime in the years up to 1906 the family appears to have moved to Draycott, Derbyshire, probably to take up work in that area, possibly at Victoria Mill that had recently been taken over and developed by Ernest Jardine. It wasn't long before James met Edith Ellen Burton, the daughter of William, a widower who, as was then the norm, probably expected his daughter to remain in his household. Two children - James in 1905 and William Edwin in 1907 - were born to the couple before they were able to marry in 19075. By 1911, both Henry's and James's families had moved to Beeston and were living at numbers 11 and 20 Myrtle Grove respectively, with several of James's siblings having found work in the local lace factories6. By this date, James and Edith Ellen had three more children - Cyril, Elizabeth and Frederick7. But there was a problem, both Henry and James, father and son, were missing from the family census schedules - both, for some reason not yet discovered, appear to be prisoners in Bagthorpe Prison in Nottingham8. By the following year, it seems, they were back with their families as another daughter, Doris, was born to James and Edith Ellen in 1913, and another, Edith Ellen at the end of 1914, followed by another son, George, early in 1915. There were sad moments too, with the death of the infants Frederick in early 1912 and Doris in the autumn of 1914. Elizabeth Emma, James's mother died at the end of 19149. Now that war had come, the lace trade was more or less suspended and James may well have struggled to support his wife and family. Perhaps with no other options, he enlisted with 16th (Chatsworth Rifles) Battalion Notts & Derby Regiment in June 191510. This battalion had been raised at Derby in April by the Duke of Devonshire and the Derbyshire Territorial Force Association. Although James's Army Service Record has not survived, it is likely that his basic training followed all of those recruits in the early days of the battalion which joined 117th Brigade of 39th Division at Winchester in September and then Hursley and Winchester, before crossing to France on 6th March 191611. In the summer of 1916, the battalion took a very active part in the Battles of the Somme which would have been a terrible introduction to the awful of trench warfare on the Western Front and the terrible casualties that it brought - with little or no gains to show for them. During 1917. it was also a part of the Third Battle of Ypres - known as Passchendaele - another period of brutal trench warfare, fought in a quagmire 0f stinking mud with horrendous casualties. At some point, we have no record when, Private Kerry was transferred to 10th Battalion The King's Shropshire Light Infantry. On balance, it is likely that this would have been in mid-May 1918, when 16th Battalion was reduced to cadre strength. In the preceding March 1918, the German Army had launched its Spring Offensive from the Hindenburg Line with the objective of ending the war before American troops and resources could tilt the balance towards the Allies. The objective was to smash through the Allied lines, push the British forces into the sea and to cut off their supply lines by seizing the ports. During the next few weeks the enemy attacks made worrying progress and, in the desperate fighting to limit the advance, there were heavy casualties before the offensive was eventually ran out of steam. For its part, 16th Battalion had fought courageously during March and had taken very heavy casualties - 21 Officers and almost 300 other ranks. These terrible numbers, coupled with those experienced across other units were proving difficult if not impossible to replace and the battalion became one of those that were essentially disbanded and its men distributed across other battalions. 10th Battalion Shropshire Light Infantry had been serving in the war the Middle East until returning to the Western Front in May 191812. August 1918 came to be seen as the turning point of the First World War on the Western Front and the beginning of the Allies' Hundred Days Offensive during which the enemy was pushed back, but against relentless resistance. On 18th September, the battalion took part in what became known as the Battle of Epehy. This was an offensive against enemy forward outposts in front of the Hindenburg Line, Germany’s last line of defense on the Western Front. Private Kerry was killed on the 21st, in the fighting that continued. Immediately after he was killed he was buried nearby in Longavesnes British Cemetery13. After the Armistice, many burials were 'concentrated' - that is, exhumed and reburied - and moved from scattered and isolated locations into more formal cemeteries that could be carefully and properly cared for. It is that context that the body of Private Kerry was moved to Tincourt New British Cemetery. Tincourt is a village about 7 kilometres east of Peronne which was occupied by British troops in March, 1917, during the German Retreat to the Hindenburg Line. From the following May until March, 1918, Tincourt became a centre for Casualty Clearing Stations. On the 23rd March, 1918, the villages were evacuated but were recovered, in a ruined condition, about the 6th September. From that month to December, 1918, Casualty Clearing Stations were again posted on the site of Tincourt. 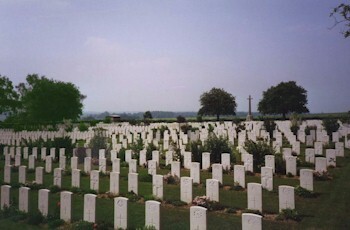 The cemetery was begun in June, 1917, and used until September, 1919; the few German burials, during their occupation of the village, are in Plot VI, Row A. After the Armistice it was used for the reburial of soldiers found on the battlefield, or buried in small French or German cemeteries. There are now nearly 2,000, 1914-18 war casualties commemorated in this site. Of these, over 250 are unidentified and special memorials are erected to even soldiers from the United Kingdom and one from Australia, known or believed to be buried among them. 14. Private Kerry was posthumously awarded the British War Medal and the Victory Medal15. His financial effects of £14 14s were paid to his widow, for herself and their children, on 21 February 1919 and she also received his War Gratuity of £15 on 29 March 1919.16. Soon after she received the news of her husband's death, Edith Ellen lost another of their children, when George, their youngest died in the closing months of 1918. Now with their remaining four children, she moved to live at 7 Mill Yard, off of the High Road, Beeston where they stayed, probably until the mid-1930s when the houses in the Yard were cleared as unfit for modern occupation. By 1939, she was living at 107 Wollaton Road with her son Cyril and daughter Elizabeth, then Mrs Taylor, and a grand-daughter. She died in 1945, aged 68.14. 2His birth was registered in Nottingham Registration District in Q4/1883 (Ref 7b 284). 3Henry Kerry and Elizabeth Emily Silcock were married at Christ Church, Radford, Nottingham on 31 July 1881. 4Nottingham: 1901 Census, Piece 3184 Folio 170. James's siblings were Henry (1882-1963), George (1886-1960), Louisa Jane (b. 1888), Elizabeth Emily (1889-1975), Rose Ellen (b. 1891), Edwin Samuel (1894-1973), Agnes (1895-1991), Joseph (b.1897). Albert Arthur (b. 1900) and William (b. 1906). They were baptised together on 23 March 1907 at Shardlow, as 'James Kerry Burton' and 'William Edwin Kerry Burton', the sons of Edith Ellen Burton. James & Edith Ellen's marriage was registered in Shardlow Registration District in Q3/1907 (Ref 7b 1085). 6Beeston, Notts: 1911 Census, Piece 20430 RD429 SD3 ED5 Schedules 249 and 254. On the latter schedule, James's name has been entered and crossed out. 7Cyril was born on 28 July 1908, Elizabeth on 11 September 1906 and Frederick was 6 months old in April 1911. Each of these births were registered in Shardlow Registration District (Precise dates from the 1939 Registration). 8Nottingham: 1911 Census, Piece 20672 RD430 ED39-42. Their ages are shown as 50 and 30 respectively, both with an occupation of 'Lace hand. Twist' and born in Nottingham. Bagthorpe Prison was on the site of what is now Nottingham Prison. Frederick's death was registered in Q1/1912, aged 1 and Doris's death in Q3/1914, age 1, both in Basford Registration District. Elizabeth E Kerry's death was registered in Shardlow Registration District in Q4/1914 (Ref 7b 595), aged 51. 11The outline of the deployment of 16th Sherwood Foresters is based on its entry on the Forces War Records website (www.forces-war-records.co.uk/units/319/sherwood-foresters-nottinghamshire-and-derbyshire-regiment). 12As its War Diary does not appear to have survived, only a general outline of 10th Battalion Shropshire Light Infantry in May to August 1918, derived from various sources, has been possible. 13The position of Private Kerry's original burial and its subsequent move are recorded on a Burial Return linked to his entry on the Commonwealth War Graves Commission website. 15Details from James's Medal Card and his Medal Roll entry - available on ancestry.com. 16Details from his entry in the Army Register of Soldiers' Effects, 1901-1929 - available on ancestry.com. 17George's death was registered in Basford Registration District (of which Beeston was part) in Q4/1918 aged 2 (Ref 7b 493). Edith Ellen's death was recorded there in Q4/1945 (Ref 7b 151). Other family details are from standard genealogical sources, including Electoral Rolls and the Registration of September 1939.